Excerpt from "Prosper, Can You Tell Me More?" JACOBSON, formerly "Mississippi Landing," was named after Paul Jacobson who ran the local post office and mail route for a number of years. Jacobson is not an incorporated city, and the subdivision is called "Bridge Park." There have been several businesses, schools, and a church there over the years. The Bridge at Jacobson at its new resting place. 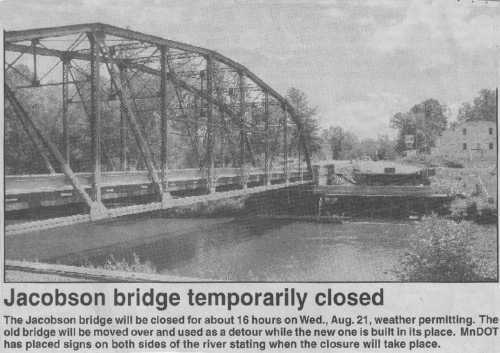 On Wed., Aug. 21, the Jacobson Bridge was moved over to become a bypass while a new bridge is built in its place. Sherman Lindgren from Blaine and Bob Feero from Hill City were making plans all summer to come to Jacobson to spend the day watching the bridge being moved. In fact, they even packed a picnic lunch so they wouldn't miss a thing. 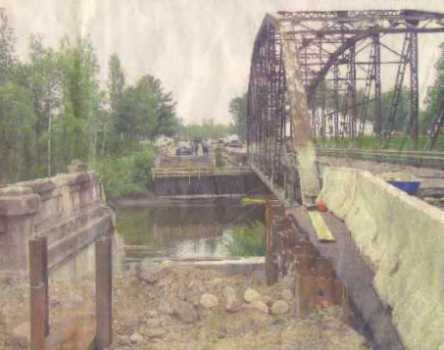 Sherman was 9 and Bob was 2 when the original bridge was built in 1927. People brought their children and grandchildren to watch the bridge be moved and TV news crews from Duluth were there to document the event for the evening news. The bridge weighs 174 tons and is 171 feet long. The bridge was moved over by jacking up the four supports with rollers put under each one. Using a winch, run by the hydraulics of a bobcat on each end, the bridge was slowly rolled over on beams to the new abutment. According to David Mavec, MnDOT, they will begin construction on the new bridge immediately but do not expect the new bridge to be completed until next spring. The new bridge will be 40 feet wide and will have a 12 foot driving lane with an 8 foot-shoulder. Kent Koehler, MnDOT construction inspector, will be onsite while construction is underway. Mavec said that Charlie Johnson, Redstone Construction superintendent, did most of the planning for moving the bridge over and that he probably sat up many nights trying to figure out exactly how to do it. Overall, the bridge moved over very smoothly. "JACOBSON AND THE STORY OF MISSISSIPPI LANDING"
from the book "Prosper, Can You Tell Me More?" The bantering continues to this day. Is it Mississippi landing or is it Jacobson? Actually both are true, but Jacobson seems to have won out as far as the traveling public are concerned. The highway signs and the mail system refer to Jacobson, but it is still Mississippi Landing in the hearts of some of the local residents. How did these two names come about? To understand the problem we must go back to the beginning and see how Mississippi Landing got started. During the fur trade era, the confluence of the Swan River and the Mississippi were logical crossroads. 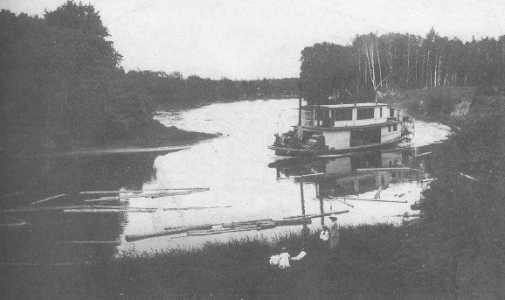 The Floodwood Indians came down the Swan River as they traveled to Big Sandy or to other areas. Early fur traders no doubt camped on the banks where the two rivers met. It was a useful place for camping and proved to be an excellent base for the early loggers. Some of the early loggers such as Joe Libby, Henry F. Brown, and Sam Wilson benefitted from the site as they built their tote roads up from Aitkin and into the Itasca County timberlands. Besides these major stops, there were up to 79 various stops at farmsteads along the way. Meals on the steamboat were 25 cents and lodging was 50 cents. The boats used cord wood which was contracted for $2.50 a cord. When landed on the riverbank, the passengers would line up, and the wood would be passed from one person to the next for loading. In later years, Harry Riggs ran a motor boat from Verdon to Mississippi Landing hauling passengers, mail, and freight. The main benefactors of Mississippi Landing were two loggers, Ammi Wright and Charles Davis. They recognized the location as an excellent spot to build a base camp for their logging operations and as a terminus for their logging railroad. They saw that piers could be built, and logs could be dumped into the Mississippi River where they could then be sent down to the lower river sawmills. 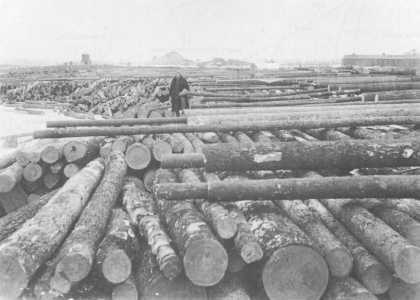 Much of the easy to get at timber had already been cut by 1890. The previous loggers had cut all the pine near to the rivers and now it was much more difficult to get at the timber. Many of the loggers had about given up as the timber in the Gardner area and on the range were not near enough to water to make it economical to skid and sluice to the far off streams and rivers. 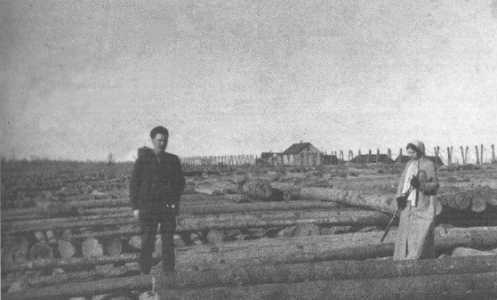 The main foreman for the Swan River Logging Company camp at Mississippi Landing was Tom Murphy. Murphy was not above taking a few liberties with the company trains at times. "Murphy would tell us stories about how they would fire up the old # 1 engine and go to Swan River to get a bottle and then come back to the landing and drink it." (Per interview with Robert Lundin on 1/22/1990) Murphy had a large farm setup at the landing, where they raised food for the logging camps. It wasn't the total supply for the hungry jacks, but the farm did go a ways to hold down the amount of purchased foodstuffs. At the Mississippi farm, about 2 car loads of potatoes, carrots and assorted vegetables were raised in an average year. A trestle was built over the Mississippi in 1908 when the Hill City Line was constructed. 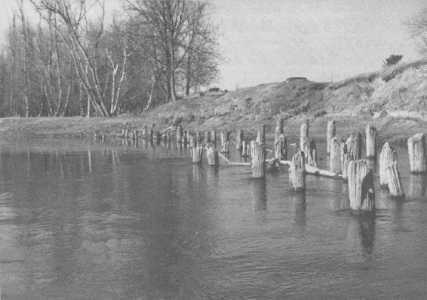 The trestle had a "swing" bridge in the river which could be turned to allow steam boats to pass by. A ferry was used for a number of years on the downstream side of the trestle. (See THE RABEY LINE by Robert Lemen) Once across travelers could then reach points in Itasca County. The first telephone lines came in to the Jacobson area in the mid teens. There was a line from Warba that tied Jacobson to the rest of the world. Because the Swan River Logging Company was about finished with their logging ventures, it was important to the Mississippi Landing community that the Hill City enterprises were now in full swing. 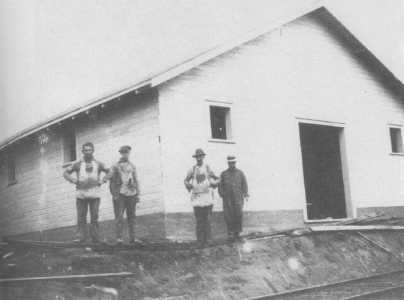 "After twenty years of steady logging operations in the vicinity of Sturgeon Lake, the Swan River Logging Company, with offices in this village, is about to finish its contract and according to W.C. Smith, general manager, the last train of logs will be shipped the latter part of this month, and by the first of April the Swan River Logging Company will very likely go out of business." (Bear River Journal ~ Feb. 15, 1917) The Swan River Logging Company kept operating the Mississippi Landing as a company farm until 1928, when they finally ended operations. Another "paper town" was platted at the junction of the Mississippi spur and where the main line headed west for Hill City. This plat was recorded on December 19, 1922 by the Hill City Railroad Company and was called "Mississippi Junction". There were high hopes for this new plat. A potato warehouse was constructed as well as a section house. A pump and tank were set up there, as well as a drilled well for the trains as they came by. 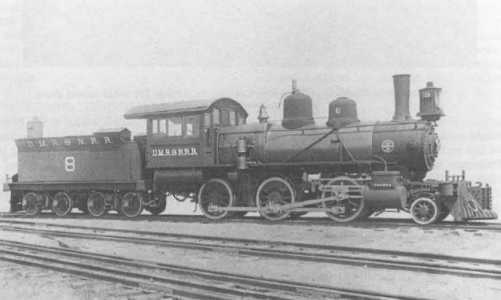 (Per President's Subject File # 22F.5.9B�Great Northern Railway Company Records. Minnesota Historical Society.) A scale was also put in for weighing the cars as they came through. A sawmill was set up there, and it appeared that the new townsite had a lot going for it. "The lumber mill known as the Summers Mill at Mississippi Junction commenced operations the first of the week under the management of John Moore of Minneapolis. The logs will be taken from the surrounding country and a good season is looked forward to. (Hill City News ~ Nov. 19, 1925) However, like other paper towns, it didn't develop any further. By 1925, most of the good hardwoods had been cut near Hill City Pail Factory. Hardwoods were known to be several miles south of Mississippi Landing, but how to get them to the railroad became the problem. A new technology had just been developed, and it was decided to try it here. 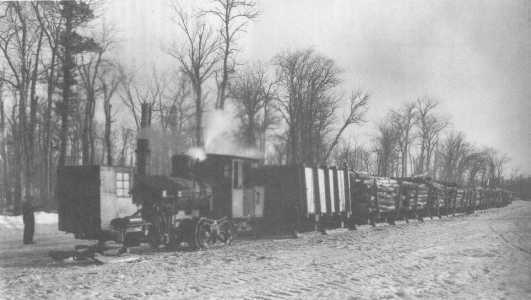 A steam hauler was brought to Mississippi Landing and ice roads were made as far south as Wolf and Boot Lakes. ("THE OLD SAVANNA PORTAGE" by Irving H. Hart) The hardwoods were then cut and drayed to landings along the ice road, where they would then be loaded onto the steam hauler's cars and brought to Mississippi Landing. 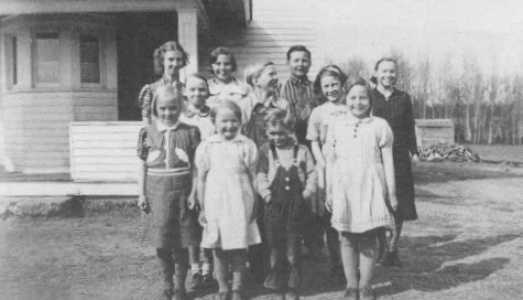 From there, they would be loaded onto railcars and sent on their way to the Hill City pail factory. A local paper relates: "This hauler is an ordinary steam driven machine with sled runners in the place of the front wheels and caterpillar tread as back wheels. This machine will haul from 35,000 to 50,000 feet of logs in one load, while a team of horses will haul only 3,000 feet in one load." (Hill City News ~ Nov. 5, 1925) This ingenious method of log hauling extended the life of the Hill City pail factory and was the forerunner of modern day caterpillar dozers. While construction of the Jacobson Presbyterian Church began in 1927, the building wasn't completed until 1928. It was the first church in the area and proved to be a positive influence for the town and a real community center. (Hill City News ~ Nov. 1, 1928) The church was a product of the "sky pilots" or preachers of the timber lands. On June 5, 1928, the plat of Bridge Park was recorded by James and Margaret McDonald. This plat was successful, and the present community of Jacobson is recognized by the development in this plat. So how did Mississippi Landing become Jacobson? 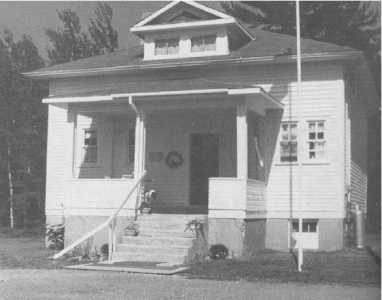 It probably began when Paul Jacobson opened the first post office at Hiawatha. From that point on people referred to the area as Jacobson when they sent mail to Jacobson's Post Office. In later years, the highway department placed signs on Highway 65 that said "Jacobson" and from then on, the name was adopted by most people and is used to this day. 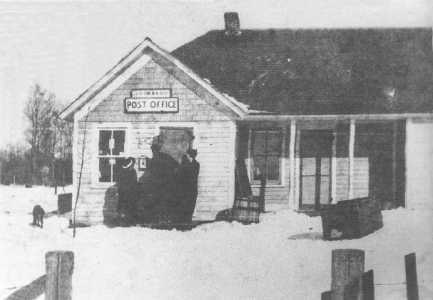 The post office was located in at least four places over those years. The Postal Service did not own the buildings. Some of the buildings were leased and others were in the postmasters' homes. The current post office building is owned by Sidney Saari, whose home is across the road. Postmasters who served in Jacobson were: Paul Jacobson, 1901; August McDonald, 1906; Robert Greenwood, 1913; Harriet Culver, 1918; Julia Simons, 1920; Viola Johnson, 1923; (she served there the longest with 27 years); Geraldine Kleven, 1950; James Kleven, 1965; Katherine Melquist, 1971; and Anita Kurtock, 1985. 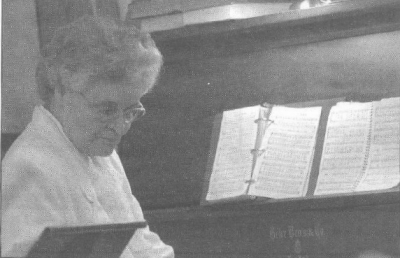 Preparing to worship: Dolores Hughes plays the piano at the Jacobson Community Church. She has been playing now for 12 years. Prior to that she played at the Full Gospel in Grand Rapids.